As many of you know, I capture a lot of my bird photos through my office window. Lately though, I've been noticing that my photos just aren't as good. Probably due to the fact that my windows could use a cleaning. Ugh! Might be a weekend chore. 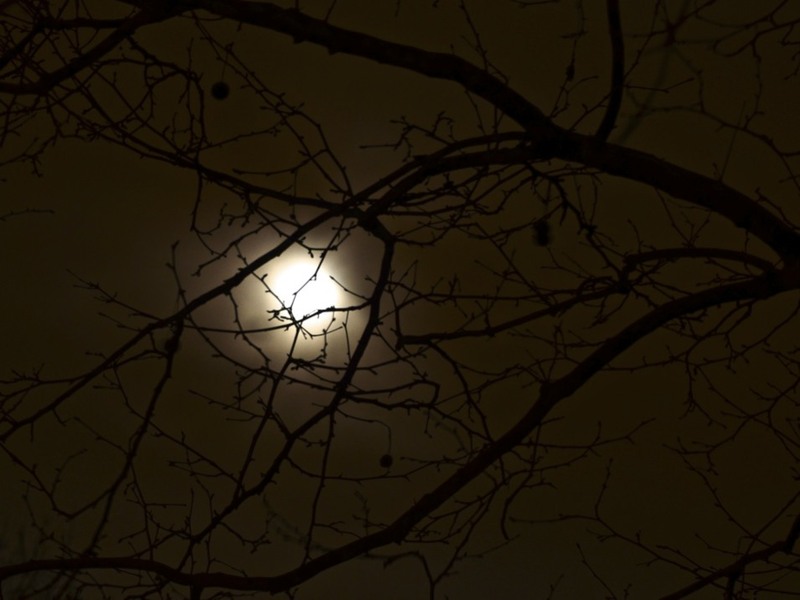 Did you happen to catch that full moon last night? Pretty awesome. I thought I'd practice my night photo skills. Which are way below par. And of course, by the time I got out to take some pics, it had turned cloudy. Bummer! But a number of you shared what I couldn't see. Loved them! 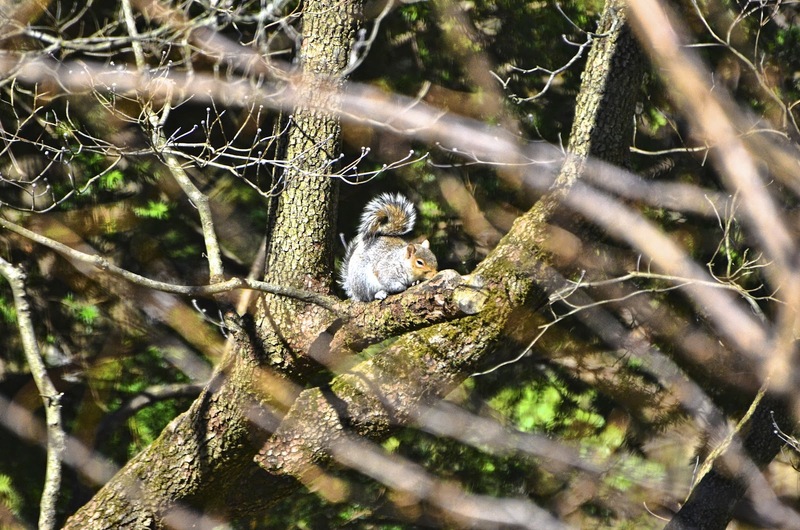 With the weather warming up, Rocky Squirrel and all his friends have been quite active in the backyard. Flirting and chasing and constantly trying to figure out how to bust open my bird feeders. Fortunately ... they have been unsuccessful! All that activity can be exhausting as Rocky demonstrated yesterday. I couldn't figure out why he was just sitting on the branch and not moving. Very unusual. I watched him for a while and thought perhaps he was sick. and then returned to his napping post. Who knew a squirrel could be that still? My squirrels have suddenly become voracious eaters as well as being mighty frisky. I know what you mean about the windows!! I shoot so many shots from mine!! I love your captures for the day, Reena, as always. That squirrel is so adorable -- you surely don't see them nappy like that very often!! I did see the moon last night -- it was actually about 4AM, but I was too sleepy to reach for my camera! It's still a lovely shot! I'm still working on my moon shots! Hope you have a great weekend! I've missed your blog this week, and I hope you're doing well and enjoying your day!! That last photo! Who would have thought that they REST! Awe, that last shot is a cute one. I take bird pics through my windows too and they are terrible right now. So desperate for a clean. I don't think I've ever seen a squirrel stay still let alone sleep. A few days ago, that is how I captured my night time moon. Awwwwww.... that poor lil' thing needed a nap :) Too cute! Could Rocky be a Rockette and going to be having little Rockellas? Looks a little fat to me. This has got to be a first, I have never seen a squirrel napping! I didn't even think they took naps, they have such a speedy metabolism. Well done!! I guess he just got a little tuckered out! the squirrel might be confused by the odd weather. Maybe he need more hibernation. Who knew! I never saw a squirrel sleep. I never get good night shots. But you ALWAYS get good shots night or day! Hi there - nice sleeping squirrel! A nap in the woods sounds pretty good at present. My windows are always dirty because it helps keep the birds from hitting them and that is important during migration times when you might have visitors..so you are doing a good thing.. love the napping squirrel.. Such a cute, sleepy little squirrel! In the winter, I take the screen out of the bedroom window and open the window for a clear shot. Does squirrel become tired? Does it pass through a dream state? Too too cute! Oh he is adorable just having a little nap. I want a squirrel!!!! Hey, I thought it was a texture layer or something new. Who knew dirty windows could be so handy in creating something different. I saw a squirrel take a nap for 15-minutes outside my office window one day. I was shocked. It really stretched out. I rather like the bird photo, through dirty window or not. 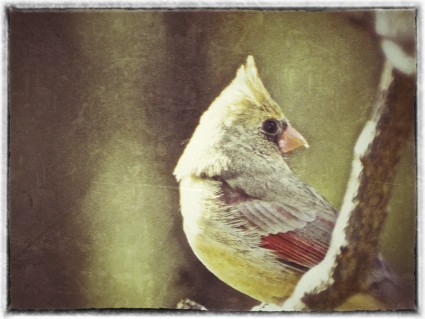 Is it a cardinal? Although I love birds, I'm not very good at identifying them. 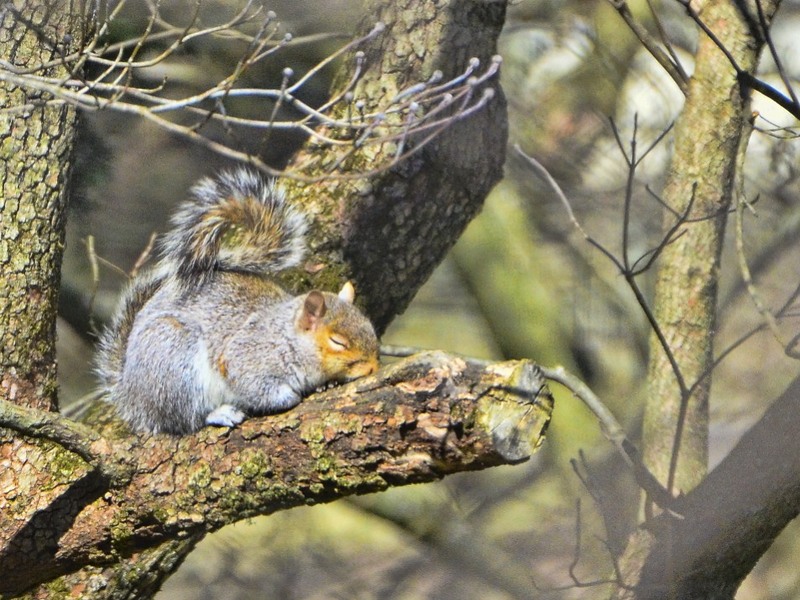 I love this-what a rare moment to watch a squirrel sleeping! I know first hand that they almost never stop-we had some in our attic last year, which is also our bedroom! Wonderful collection of shots. The cardinal is my favorite. Have a wonderful weekend,Reena! That is to funny.. Who knew squirrels took naps.. Such wonderful photos my friend..
That's so funny! I've never seen a squirrel do that before! Great pictures! Have a great weekend. My family of squirrels is working diligently on the two feeders full of sunflower seeds. Some days, I ignore them but if I think they are keeping the goldfinches away, I go out and chase the squirrels away....for awhile. Share and share alike! 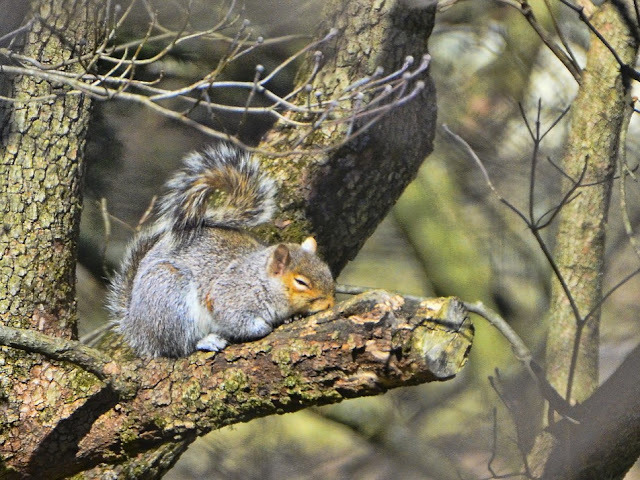 awww, what a precious photo of the sleeping squirrel! love it! The squirrels are out in full force here. They are fun to watch. Ha! 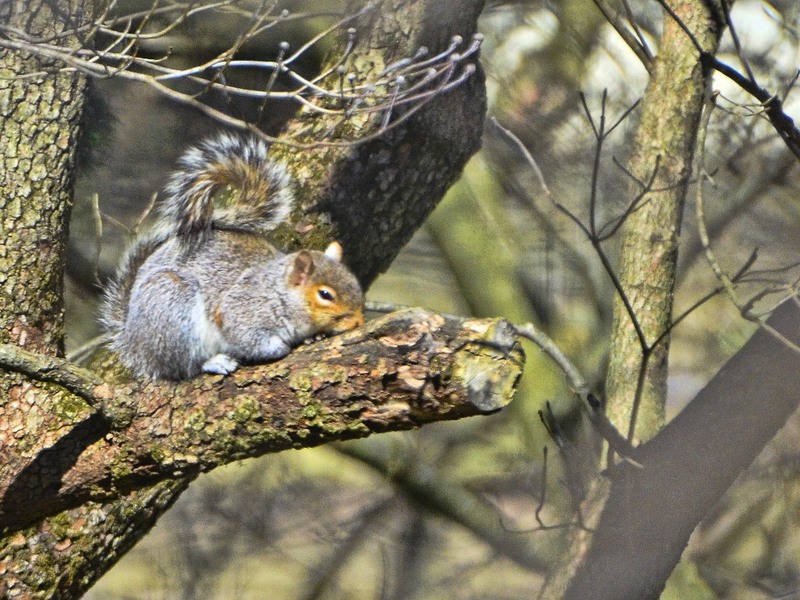 Even the squirrels have to sleep, but who knew they'd be brave enough to do it on an open branch. 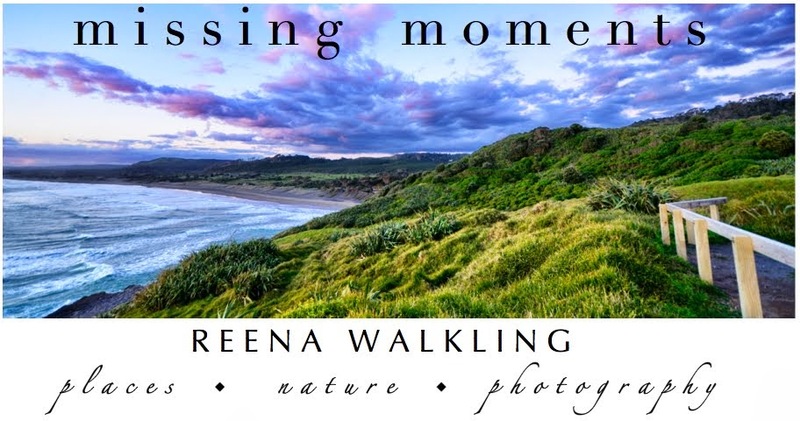 reena, i'm in awe of your photos. i love every single one. my favourite is that magical moon!!! it just caught my eye. First squirrel I've seen that's actually cute.